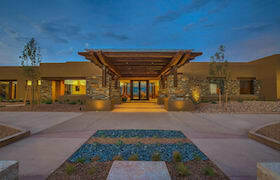 Del Webb at Mirehaven is a gated, 55+ active adult community in Albuquerque, New Mexico. Located on 300 acres and surrounded by the Petroglyph National Monument, the community features natural spaces, parks, and trails. The Amenity Center includes a fitness center, billiards, kitchen, and great room, and outside, homeowners enjoy a swimming pool, bocce, pickleball and sport courts. Homes are priced from the mid-200's. Local conveniences like shopping, medical facilities, and recreation are just a short drive away.